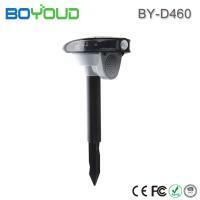 Home Companies Shenzhen Boyoud Industry Co., Ltd.
Shenzhen Boyoud Industry Co., Ltd.
1. Power Supply by Solar Energy and 4pcs Ni-Mh rechargeable battery (not included). it also can charge by additional DC adaptor (not included). 2. By switch the button to choose diffierent work mode: day, night and off. 3. The device will play loud explosive sounds (Gunshot, Barking Dog, Raptor) to repel birds, cats, dogs, foxes, and other animals. 4. The device has 4pcs 360 arc high light LED flashing to get rid of animals in dark. 6. PIR Motion Activated to save most of power, PIR Covers 120° arc, and 10 meter ground area - total of 150 square meters.